Over the years the archive has had a number of requests from individuals seeking information about “The Retreat”. Normally they have been researching their family tree and have come across birth or death records that give “The Retreat” as the location. These questions sparked a line of research. “The Retreat” was often used as a euphemism for an unmarried mother’s maternity home. However this cannot be the case here as many of the enquiries were related to death certificates. The search for an answer was clouded by the mention by correspondents of “The Retreat” being variously in Billericay, Great Burstead and Ramsden Heath and so the mystery deepened. 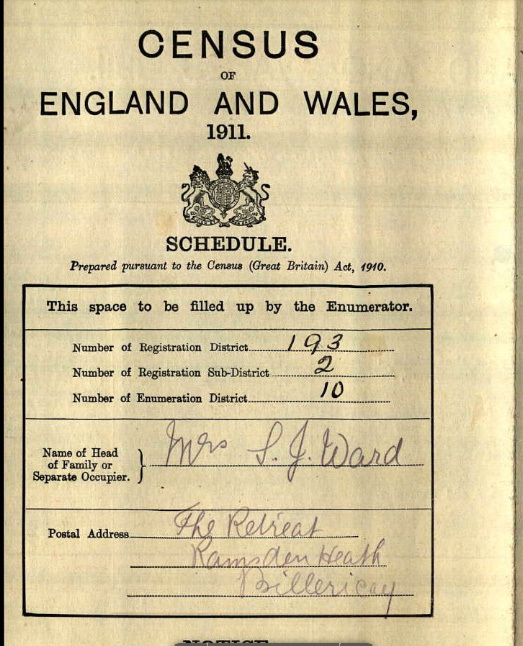 The name was also used as a euphemism for the infirmary of a workhouse, but this was not originally thought to be the case here because a lady who now lives in Australia was born at “The Retreat” Great Burstead in 1948, well beyond the days of the workhouse. Things became a lot clearer when one of my correspondents, Carol Burton, found some reports on www.archive.com of the “Administrative County of Essex Report of the Medical Officer of Health” for the years 1931-33. 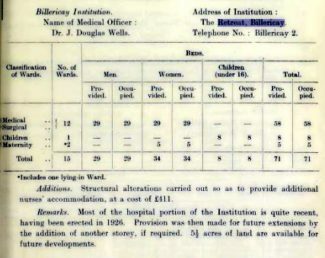 The section of the report which covers Billericay is signed by Dr. J. Douglas Wells, the local Medical Officer, with the address of the institution being The Retreat, Billericay. It is interesting to note his telephone number which is Billericay 2, I wonder how many phones were attached to the Billericay exchange in those days. 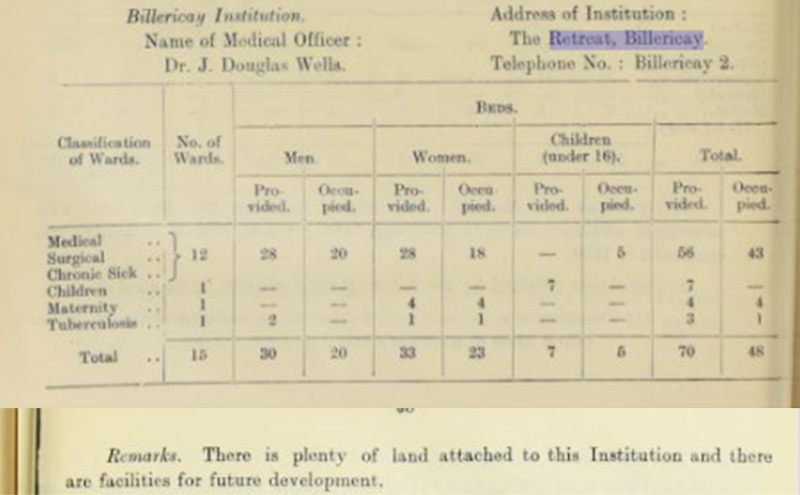 The other interesting thing in these reports is that the entries are all for Institutions , this is because the only hospital facilities were often the infirmary of the workhouse. 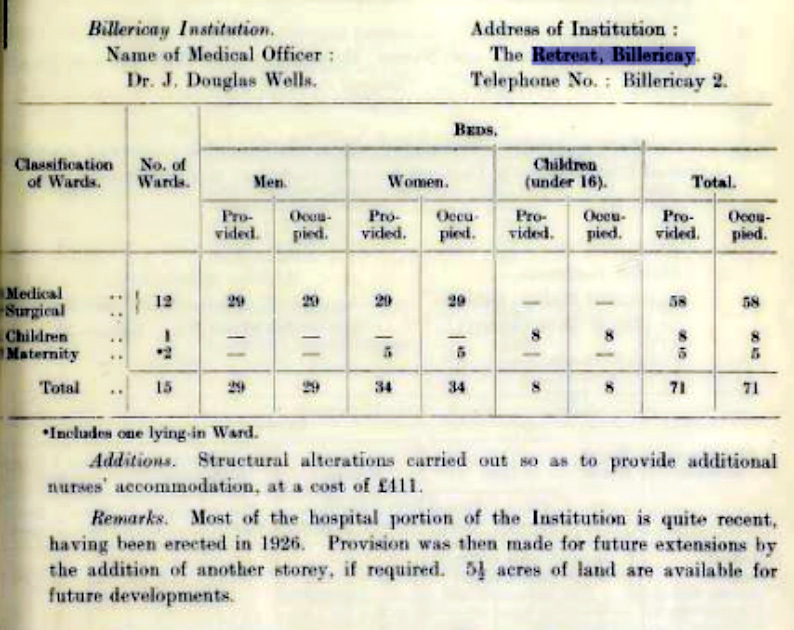 By the time of these reports the workhouse had all but ceased to exist and thus a great proportion of the facilities were occupied by the hospital, normally run by the local council, in this case Billericay Rural District Council. The reports themselves make interesting reading and extracts relating to Billericay are attached to this article. 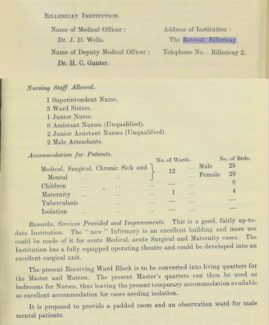 In 1931 it was noted that most of the hospital portion of the institution was erected in 1926 and that provision for extensions had been made with 5½ acres of land available. In 1932 it appears everything is running well as the Medical Officer only notes that there is plenty of land for future development. Then in 1933 he reports that whilst all is well in this relatively new hospital “more use could be made of it for acute Medical, acute Surgical and Maternity cases”. He also reports on improvements to the nursing quarters and that “it is proposed to provide a padded room and an observation ward for male mental patients”. It was around this time that the hospital started to be referred to as St. Andrews Hospital to overcome the stigma of the workhouse. So what of the reports of “The Retreat” Great Burstead. It has to be remembered that Billericay and Great Burstead were somewhat interchangeable in peoples minds as the original parish was Great Burstead. However a mystery still remaining is why a birth at St. Andrews would be recorded as Great Burstead because the St. Andrews site was in the parish of Buttsbury. Another mystery is Ramsden Heath location, also attached is a portion of a census return which clearly states “The Retreat” Ramsden Heath. 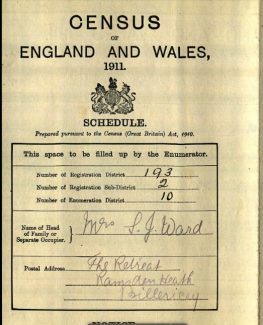 It could be that these were house names rather than an institution as there was only one workhouse that covered the whole of the Billericay Union (a very large area) and we know from the Medical Officers reports that there was only one hospital which served a wide area including Brentwood. Like many things perhaps the mystery will never be fully solved unless you know better. My grandfather died at The Retreat, Great Burstead, Essex in November 1947 according to his probate details. Regarding the fact that a St. Andrew’s birth would be recorded as under Great Burstead instead of Buttsbury may be a combination of the interchangeable confusion between Billericay and Great Burstead, and the fact that Buttsbury as a parish was actually abolished in 1938. As you can see from the registration district lists above, Buttsbury originally came under Chelmsford, then was split between the parish of Billericay under the district of Billericay (which itself was placed under the district of Brentwood in 1939), and Stock, which comes under the district of Chelmsford.